Some parts of this site are password protected. We have temporarily suspended issuing new accounts in response to email requests while we are remodeling. Table of contents and preview slides from a planned second edition. Errata and comments for the first edition. Slides for the first edition, prepared in most part by Ganesh Ramakrishnan: Introduction, Crawling, Indexing and search, Unsupervised learning or clustering, Supervised learning or classification, Semi-supervised learning, Social network analysis and resource discovery. My graduate elective offerings based at least in part on this book. 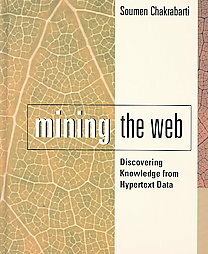 Tutorials and short courses overlapping with the contents of this book: WWW 2007, Banff Winter School 2006, WWW 2005 (Bing Liu), ADFOCS 2004, VLDB 2002, SIGKDD 2000 and SIGMOD 1999. 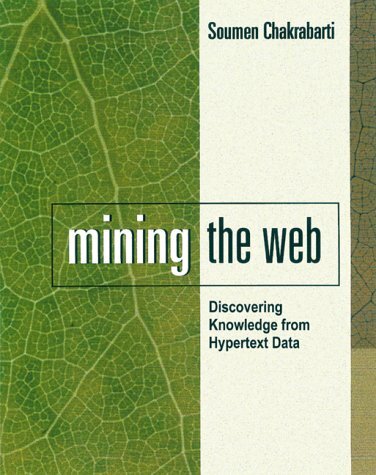 Some open-source Web-mining software related to the book. There is now an Indian edition in paperback from Elsevier India, with a reprint ISBN 81-8147-886-X. Please contact if you have any questions. Honorable mention by the Association of American Publishers. Review on Search Engine Watch (local copy). This page had 441 and 290 hits on the first two days after the review was posted. Now it's back to normal. Clearly, search engine optimization matters! ... you must understand how learned books are written in case you ever want to write a learned book. First thing you do is get a thousand references, chosen at random. You then put them into the book, in the order you reach them ... And stick two or three lines of your own between each of them to act as mortar ... And you're all set. ---Isaac Asimov.